Get fit in the 2018 New Year! Choose Custom Workout Shirts, Custom Athletic Shirts and Dry Fit Fitness T-shirts to keep you comfy, dry, and motivated to reach your 2018 New Year Goals! It’s time for 2018 New Year’s Resolutions and goals! Whether you own a gym or just plan to spend some time in one, quality customized fitness apparel will help keep you dry, comfortable and motivated to reach your 2018 fitness goals. Custom Athletic Shirts and Dry Performance Apparel. You can design custom sweat-wicking athletic apparel online in just minutes using our free online design tool. 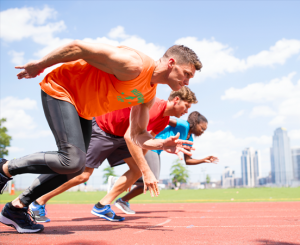 It’s fast, easy, and we offer many choices for wicking athletic apparel with no minimums. Group Discounts. Do you need a dozen or more shirts? We offer discounts for large orders. The more your order, the more you can save. There are no set-up fees! Fast turnaround. Our turnaround is some of the fastest in the country and our quality is second to none. In most cases, you can have your order delivered to your door in just days, not weeks. Huge Online Catalog. We have name brand athletic wear, including Sport-Tek, Jerzees, Hanes, Champion, Adidas, Alternative Apparel, NikeGolf, Gildan and many more. Simply choose your favorites and start designing now.